The beauty industry is big business these days and a very serious one at that. Suddenly we're all 'experts' or at least more knowledgeable about retinols and there's nothing better than an instagramable photo of our skincare regime. I'm not against this by any means and I too offer my amateur advice and knowledge via these pages but sometimes it's nice to meet a brand like Anatomicals that doesn't take itself too seriously whilst still offering great products. A quick look over Anatomicals website and I challenge anyone not to smile as they deliver their message with the quirky nature they adopt in their products. I'm first to admit that I'm probably a little out of their target age range but that doesn't mean I can't enjoy the products and embrace the fun nature they have and their mission to 'ban boring beauty regimes'. 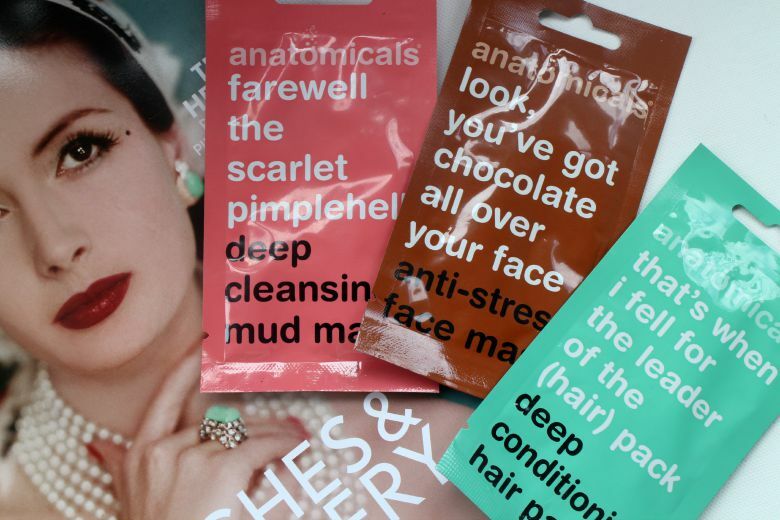 You'll see one or two products from Anatomicals popping up over these pages as I explore the range but today it's the pack of three face masks. For just £3 you receive two face masks and one hair masks, perfect as a gift or for a girls night in. Anatomicals let you know that in their land, 'rabbits run free' and 'guinea pigs rule' in short they don't test on animals and paraben free so no fear that quirky packaging hides any nasties. 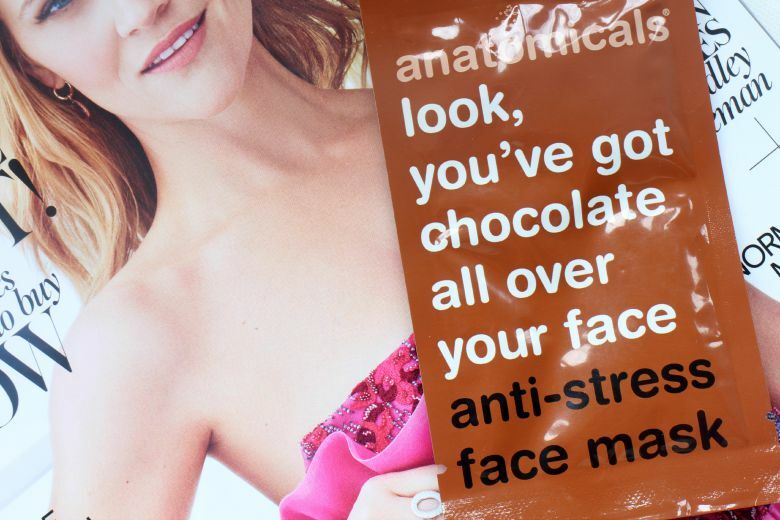 First we have Look you've got chocolate all over your face, anti-stress mask* which is quite literally like smearing melted chocolate on your face. The smell is amazing and as is typical with these scents I have to resist the urge to lick. At the time I had a sore nose from a recent cold so that area was a little sensitive but otherwise I was certainly left looking stress free. I find most masks messy and this was the case and it can be tiresome squeezing the product out but what you have to work with is worth playing with. Each mask has a fun was of giving you the instructions and it's probably no surprise that the Farewell the Scarlet Pimplehell, deep cleansing mud mask* is along the lines of 'they seek him here, they seek him there'. Clay masks are my favourite type and as such this was my top pick of the three. I use clay masks frequently to tackle blackheads and especially at that time of the month if things are a little more oily. Special minterals absorb the excess oils and help control spots. 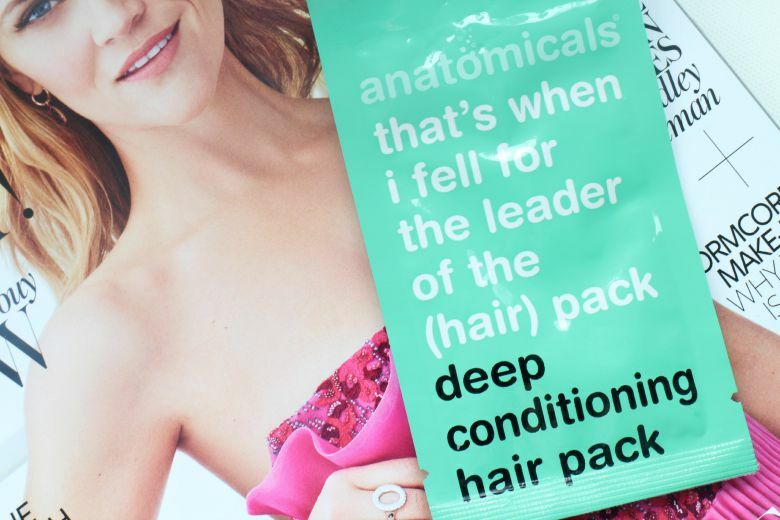 Finally is their That's when I fell for the leader of the (hair) pack, deep conditioning hair pack* which I defy anyone not to be singing the song, at least in their head right now. I rarely have much to say about hair masks and imagine if I were in more pampering mode, wrapping in a hot towel and lounging with a cocktail in hand I'd maybe have been a bit more enamored by this mask but instead I just felt like I'd used a conditioner, albeit with a little more oomph. Worth having for the price especially if you're not interested in having the larger tubs that do the rounds. Have you been tempted by any products from Anatomicals? Anatomicals can be found as ASOS, Urban Outfitters and Amazon. Brilliant, I need more chocolate in my life!